Bangkok was my very first Southeast-Asian experience and I was very excited about it. It represented a completely different world to all that I had known and the fulfillment of a dream of many years. Unfortunately I could only spend 4 days in this extraordinary city, so I had to select very well what to do in Bangkok in that short period of time. But beyond travel guides, knowing a few locals was what provided me with the most remarkable experiences there. So here I’m sharing the highlights of my stay and a definitive list of what to do in Bangkok if you want to experience it fully but are also short on time! Bangkok is the exciting, fast-paced capital of Thailand. It’s a city of contrasts: you will see cutting-edge skyscrapers shadowing shantytowns on the banks of the river. You can go to frenetic markets selling typical Thai products at a bargain price just out of colossal commercial centers selling the world’s biggest brands. You can go to sublime, peaceful temples after spending a frantic night in some of the craziest nightclubs in Southeast Asia. I spent 4 days in the city, and for me that was just enough. 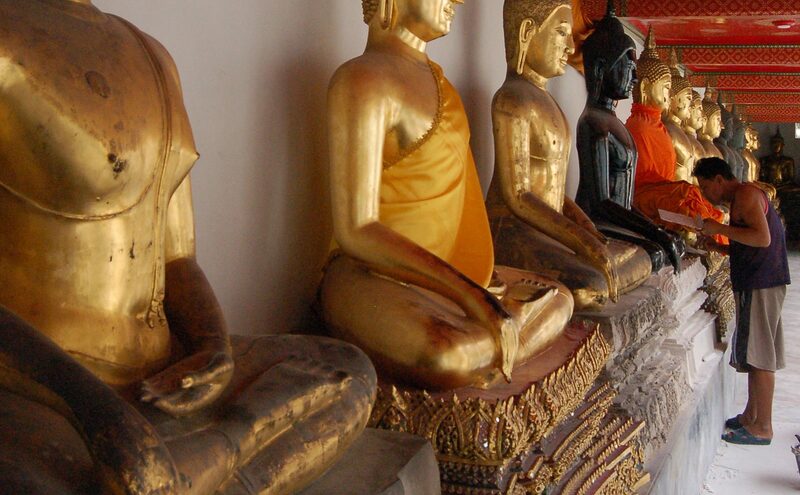 Bangkok has a lot to offer and one year wouldn’t be enough to visit all its hidden gems. But 4 days are definitely sufficient to visit the major sites and experience a bit of this vibrant and hectic city. Plus, it leaves you time to see some of the lesser known places too. Bangkok is home to true culinary delights and some of the best cheap-eats in the world. From fine dining restaurants to street food stalls, Bangkok caters to almost every taste. You can find some of the best dishes in the city in the most unexpected and unpretentious stalls. My CouchSurfing host took me to a street stall with plastic chairs on the sidewalk, which was his favorite restaurant in Bangkok! (Sorry, I don’t remember the name!) There I had my very first, delicious, authentic, cheap, locally recommended street Thai food. I had a Pad Thai, which is still my favorite Thai dish and for dessert we had mango sticky rice. Yum! On another occasion, I met a Thai friend whom I had first met in Venice and we traveled together to Pisa in 2009. She took me to a restaurant near Siam Square. It was packed with locals (always a good sign) and she ordered so much food that it just didn’t fit on the table! Needless to say, everything was delicious! And to top it off, on my last day I went to the 7th best restaurant in town at the time. If you’re thinking it was some luxurious and expensive place, you’re flat wrong. It was nothing more than, once again, a stall and some plastic chairs and tables on the street. But what came out of that stall was simply out of this world. Surprisingly, the current military government is willing to ban all street food from Bangkok, in the interests of ‘cleanliness, safety and order’. Local authorities announced that Chinatown and the backpacker area of Khao San Road are the next to face the street-food ban. After that, one would only find typical Thai food in covered malls, duly sterile and well-ordered for the tourists ‘comfort’. This sounds absolutely absurd to me for many reasons. Street food is one of the richness of the country. Not only tourists consume it but also (and mainly) Thai people, who rely on it daily. This also means that many vendors would lose their jobs. I don’t really know whether there is anything we can do to avoid it. But I strongly believe this is an immeasurable loss for the country. Banning street food in Bangkok is banning much of it’s essence and character. It would mean a tremendous cultural, economic and social loss. For me it is as bad as banning people from going to the beach in Rio. Funny fact: Thais eat ‘real food’ for breakfast, such as rice, meat and noodles! Hot hint (actually cold! ): to cope with the hot weather, get yourself a Chanomyen or Thai Iced Tea, made of Black Tea, milk and sugar. Superb! I found it impossible to find Thai hosts on CourchSurfing. It seems that the population is not really used to this network. I could only use CS in Thailand’s biggest cities, Bangkok and Chiang Mai. And even then I only got to stay with foreign hosts. I’d say if you are lucky to find a local host, read the profile and references thoroughly. This is just as to avoid any complication, since CS doesn’t seem to be much used in the country. 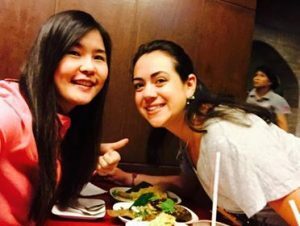 In Bangkok, I did CouchSurfing on the first 2 nights. My host was a Canadian guy who was working as a Maths and Psychology teacher in Bangkok. He was really nice and gave me a lot of tips and valuable information about what to do in Bangkok (as a good CS host). The rest of the time I stayed with a university friend, who had moved to Bangkok and opened a gym there. His main reasons were security and the living costs. It really surprised me when he said ‘security’. I just assumed Bangkok would be particularly dangerous, being this hectic, developing mega-city. But he said the crime rate is very low and the city is in general a very safe place. One just needs the same kind of care and attention they’d have in any other big city. This made me relax and stop walking around feeling so paranoid at every tuk-tuk driver that reached me. On the first evening my CS host took me on his scooter to Khao San Road. This is Bangkok’s shopping-bar-backpackers paradise. You’ll see lots of beautifully tanned tourists walking in shorts and flip-flops, amid stalls with bizarre barbecued insects and stacks of backpacker’s fashions, such as elephant print t-shirts. I almost lost control, because I go crazy about elephants and Ganesh-inspired themes. 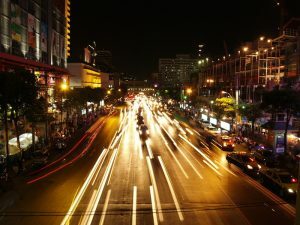 Khao San Road offers multiple guesthouses, but even if you’re staying somewhere else (like I was), the area is definitely worth a visit at night time, being a great place to go party and meet other travelers. Alternatively, you could also head to a rooftop bar for some drinks with one of the most magnificent views you can imagine. Bangkok has many rooftop bars, such as the Moon Bar or the Sukhumvit Thonglor. 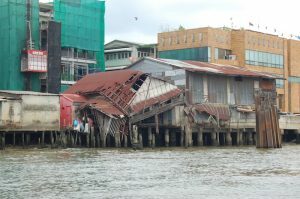 On the next morning (my first actual day in the city) I took a ferry to visit the area of Ratanakosin, the royal island. Here is where you’ll find the city’s most important sights. 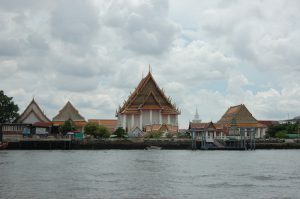 The island was artificially created by the construction of defensive channels after the sacking of the old capital, Ayutthaya. The island hosts the Grand Palace, the National Museum and Wat Pho, the Temple of the Reclining Buddha. All main tourist attractions are within a walking distance from each other. But it’s best to get an early start, as most of them close at 15:30. The central and most important construction is the Grand Palace and contiguous royal temple Wat Phra Kaew. Also known as the Temple of the Emerald Buddha, it is considered the most sacred Buddhist temple in Thailand. The Grand Palace officially opened in 1785 and marked the founding of the new capital and the rebirth of the Thai nation after the Burmese invasion. Golden stupa at the Temple of the Emerald Buddha, considered the most sacred Buddhist temple in Thailand. Right after you enter, through the Gates of Glorious Victory, you have an enticing view of the temple’s glittering spires on the left. The inside of the temple is as hypnotizing as the outside: pay attention to the details everywhere, from the flagstones to the roof, and the walls with murals from the Ramayana. 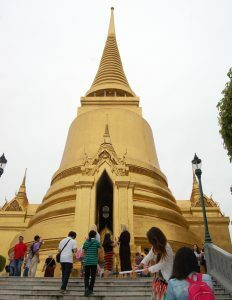 The grounds contain more than 100 buildings, so leave at least 2 hours to visit the Grand Palace and explore the other minor (but not less interesting) buildings, statues, murals and gardens. It is definitely one of the most unbelievable set of constructions I’ve ever seen. Visitors should dress smartly: women should wear pants or skirts below the knees and men should wear trousers. Because such garments are not so compatible with the local climate, you can easily rent skirts and pants from the office to the right just inside the entrance gate. They are free, but you have to leave a deposit of B200. Wat Pho is located directly south of the Grand Palace. It hosts a 46m-long reclining Buddha and the largest collection of Buddha images in Thailand. Being the oldest temple in Bangkok, it is also considered the birthplace of Thai massage, the earliest center for public education in Thailand and a school of Thai medicine. To get into the temple you have to take off your shoes and stand in a long line, but it’s worth the wait. 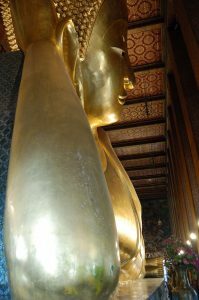 The reclining Buddha is fascinating and it gave me a sense of humbleness and veneration. The Buddha, depicted entering Nirvana, is almost as big as the chapel, not leaving enough room for a photo with good perspective. You’ll have to chose between a close-up view of his 15m high head and the 4.5 m-long feet, which depict 108 auspicious symbols that distinguish a true Buddha. If you hear coins chinking, don’t be surprised: there are 108 bowls along one side of the statue and it’s said that putting a coin on each of them will bring you luck! 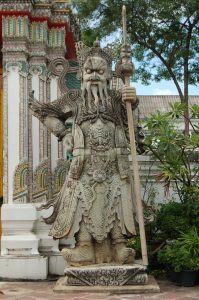 Even though the main attraction at Wat Pho is the gigantic reclining Buddha, the temples, stupas and statues that surround it are also mesmerizing and for a few seconds I wondered if I was already on the grounds of the Grand Palace. When in Bangkok, don’t miss a boat ride along the Chao Phraya River. Bangkok’s cross river ferries are not only the main means of transportation for locals, but also a unique experience for tourists. You’ll get to see the skyline of business buildings, punctuated by beautiful temples, slums, markets, cargo boats and much more. You can take the Public River Ferry from the Central Pier and go up and down the river for less than U$ 1! Bangkok is the ultimate shopping paradise. 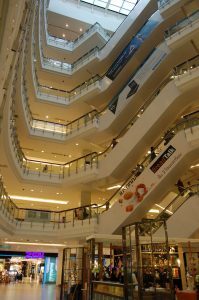 Even though this was not my main focus, I went to some of the biggest shopping centers just to have a look. If you’re looking for posh fashion and brands, go to the Siam region, where you’ll find huge shopping centers such as Central World, Siam Paragon, Emporium, Siam Center and Siam Discovery. Bangkok is home to one of the biggest street markets in the world: the Chatuchak Weekend Market. With some 15 thousand stalls, it has everything you might ever (or never) need. You can also visit the awesome floating markets around the city for a real Thai experience, such as the Khlong Lat Mayom and Thaling Chan. The Chinatown in Bangkok is the country’s largest Chinese district. It has an extension of narrow railways with temples and shops, many of which selling gold and jewelry, but also teas and random Chinese parafernalia. During the day it is a shopping area and at night it turns into a street food paradise. Bangkok has 4/5 of the country’s automobiles and traffic is a major problem in the city. Despite the Skytrain and subway lines, it is still difficult to get around the city, mainly during rush hours. 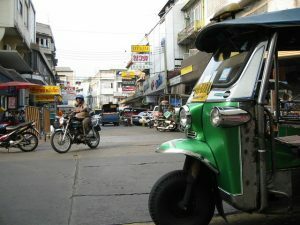 One solution was the implementation of side-street motorbike taxis, which are pretty helpful if you’re traveling alone. Tuk-tuks are also a practical means of transportation through the city for a bargain. Moreover, Bangkok suffers largely with pollution: the city has the lowest rate of green area per inhabitant in the world. While London has 30.4 square meters of public parkland per person, Bangkok has only 0.4. As a result of this, the air quality decreases and the rate of respiratory diseases increases. If the choking fumes get too bad, you can choose to take a break and visit Lumpini Park. It’s a haven of fresh air, shade and tranquility in Bangkok. My CouchSurfing host lived just a few blocks from the park and it was great to have this place of peacefulness to rest after a hot, noisy and hectic day in Bangkok. Bangkok is always hot. When I was there I ran out of energy every day at around 3pm, just because it was so hot and chaotic. The best time to visit is from November to January, when it’s humid but still comfortable. The rainy season spans from May to November and brings afternoon showers after warm and humid days. The least ideal time to visit is between March and May, because that’s when the temperatures are the highest. 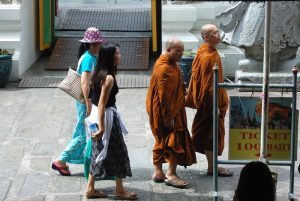 When I got to Thailand, I thought it would be much more conservative regarding clothes (like in India). I got a taxi from the airport and the amount of people wearing tiny shorts and skirts startled me. In Thailand it’s common and socially accepted to wear short clothes that are fresher and expose more of your body. However, remember that to enter most temples you are expected to wear respectful clothes. That means shirts with sleeves, long pants of skirts and shoes. If you’re wearing sandals, make sure to take socks, because some temples don’t allow bare feet. Most of the times, you can rent or borrow some proper garment at the entrance or from street vendors, who wisely seize the opportunity of having tourists melting of heat in their city. You can call it hectic, crowded, noisy, but Bangkok is still a must-see. It is one of the leading economies in Southeast Asia and one of the fastest growing cities in the world. It has breathtaking temples, amazing nightlife, mouthwatering and cheap food everywhere and it’s a great place for shopping. I hope you enjoyed this post with recommendations of what to do in Bangkok!